Maximum speed is steplessly adjustable. The 2 buttons on an ordinary mouse are replaced by 5 buttons on a joystick mouse. The buttons on a joystick mouse have the following functions: "Single click", "Toggle hold/release", "Right mouse button" and "Double click"
As an option, one of the two "double click"-buttons can be replaced by a scroll button. 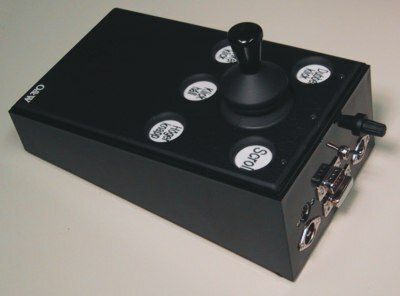 With this button activated, the joystick acts like the wheel on a scroll mouse. 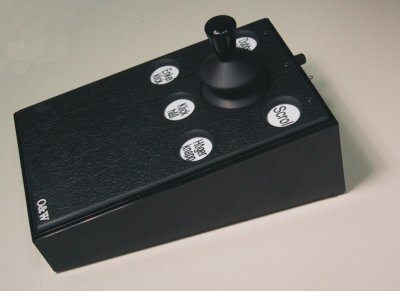 The joystick-mouse fits any IBM-compatible computer, and is connected to the computer through the serial port or the mouse-port. On the back of the Joystick mouse there are sockets for connection of one PS/2 and one serial standard mouse. The external mouse and the joystick mouse can be used simultaneously. The joystick mouse is provided with sockets for external switches. 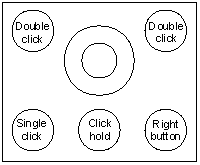 The 5 buttons on the joystick mouse can be replaced by auxiliary switches. a combination of mouse substitute and guiding device for THOT. The combi model can also function as a breaking guiding device . The same joystick can guide a mouse and operate a THOT. The change is made by pressing a key .